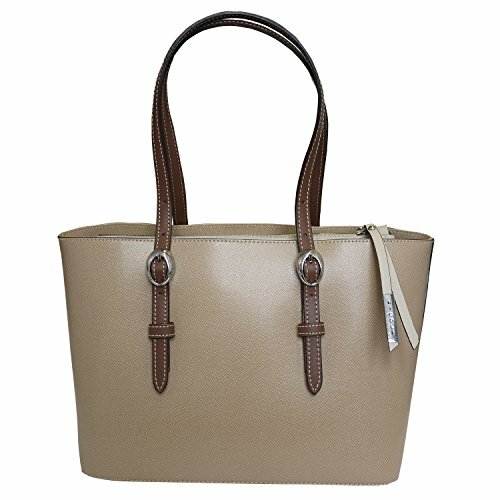 Nicoli 'Briglia' tote grab bag, designed and made in Italy by craftsmen in Italian leather. This beautiful structured bag is made in fabulous quality Italian saffiano leather. Double top contrast brown leather handles with silver coloured hardware and bang on trend buckle detailing attache to the body of the bag. A single top zip closure reveals a single plain lined interior with a wall zip compartment on one side and 2 pouches the other. 5 studs on the underside protect your bag. The long top handles allow this beautiful grab bag to be worn on the shoulder too. A stunning bag to add a touch of class to your outfit.